Used as a lotion applicator reach and angle are great my one main concern is that the applicator pads are so thin they won't stay on the applicator when trying to rub on my body. I have an older one that I purchased a while back and the pads that came with the older applicator two times thicker and stay on the applicator just fine so I guess I will try using two of the new pads at a time and hope they'll stay. Hope if and when I have to order extra pads they will be as thick as the earlier ones I purchased. I will not order again. Both bath products were shoddy and came apart. Works well to reach back area with lotion due to restricted movement. AND WILL NOT MILDEW. THE CHANGEABLE HEADS BEAT BRISTLE BRUSHES. YOU CAN ACTUALLY APPLY LOTION TO YOUR BACK. AFTER DISCOVERING HOW GREAT IT IS AND AFTER TRYING TO GET A GOOD CLEAN BACK BRUSH, I PURCHASED TWO MORE FOR MY ADULT GRANDDAUGHTERS BOTH OF WHOM TRAVEL ON BUSINESS A LOT AND THEY CAN TUCK THIS INTO A SUITCASE. I WILL MAKE IT A PART OF THEIR "CHRISMTAS STOCKINGS"! WHEN MY SON SEES IT HE'LL PROBABLY WANT ONE TOO. I WAS AMAZED, AS ALL I WANTED WAS A BRUSH THAT WOULD DRY QUICKLY AND WAS CLEAN AND READY TO USE. I DIDN'T REALIZE IT HAD FIVE CHANGEABLE HEADS, WHICH IS JUST GREAT. I AM STILL EXCITED AT FINDING SUCH A VERSATILE BACK BRUSH AND SOLVING A LOT OF PROBLEMS FOR ME. Use it in and out of the shower. I am able to apply medicated cream to my back. It's a perfect length and very durable. I would be lost without it. Due to medical reasons, I can not reach my feet to take care of them properly. The length allows me to reach my feet, and using the pumice attachment I can smooth my feet. The other attachments are also helpful with hard to reach places. I LOVE THIS!! I am purchasing one for my best friend's birthday present. I know she'll love it, too!! Just received it. Seems to be good and will fit my needs. A lot of options for this product. Lots of attachments. Makes bath time easier for me. Just to try to put lotion on my back. I have difficulty in bending and reaching certain areas on my body and this was the ideal solution. I chose this item because of what you are able to do especially when you are sore and hurting from working. My cousin happened to see the one I have and went crazy over it so her birthday is this month and I thought I'd get on line to see if I could find it and low and behold I did. She will be so excited. Looking for something that will support my buff puf pads...I' hoping this will work. I found something I can now reach my back, others are to short. Love the idea of different heads to wash my back. I have been looking for this item and finally found it here. Looking forward to using it. Bending is very difficult for me so I needed a long reach brush for the back and feet. The lotion pads were a big plus in my choice. With my age a some disability, this product will make application and reaching areas to clean much easier. My 90-yr-old mother has trouble bending over to reach and clean & apply medication to her feet. Need this set in order to clean myself well when taking showers. Have problem reaching my back and feet . This is 2nd set I have bought and it is a great help. This better than everything else that I have used. You will love it. Needed means to reach unreachable parts of body when showering, with decent scrubbing brushes. It's great; makes a personal for elder and disable. To wash difficult areas for washing my back and feet, also to apply lotion. Need something like this to reach places I cannot. 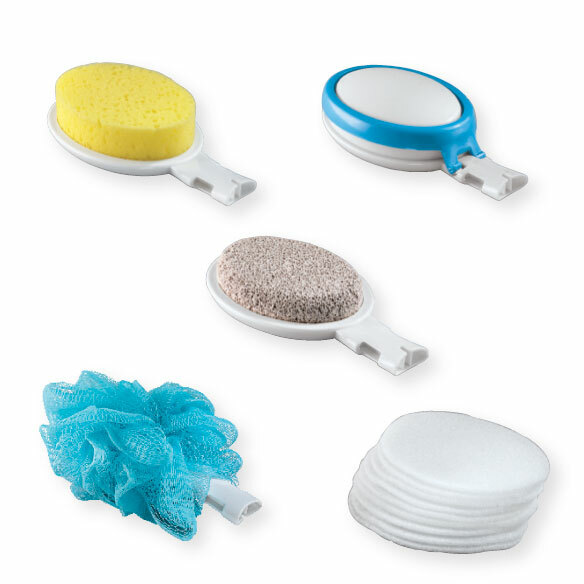 Do you have replacements for the sponge with the blue ring? BEST ANSWER: Thank you for your question. Unfortunately no, we do not sell any of these attachments individually. We hope this information will be of help to you. Is there refill for lotion application pads? BEST ANSWER: Thank you for your question. Unfortunately we do not carry refills for this product. We hope this information will be of help to you. I don't think there are. I have not been able to order any. what lotions do you use? BEST ANSWER: I use Curell Hand Lotion on the pink lotion sponge and I use Olay Body wash on the Luffa sponge. 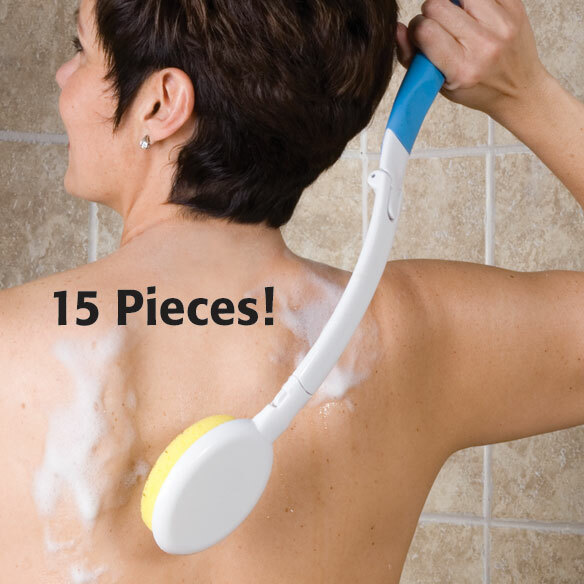 It is so handy with the handles on them to be able to use them in a shower all over your body.